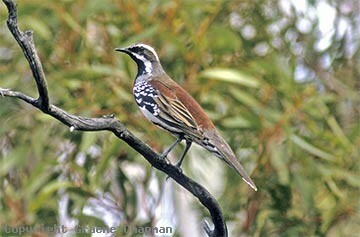 Chestnut Quail-thrushes are the most wide-ranging of all five species of quail-thrush in Australia. Principally an inhabitant of mallee shrubland, they occur also in other types of dry woodlands and scrublands over much of the southern inland, from near West Wyalong in NSW right across to the west coast of W.A. They prefer habitats with a sandy substrate. In the centre, they range up to about 100 km or so north of Alice Springs. In W.A. 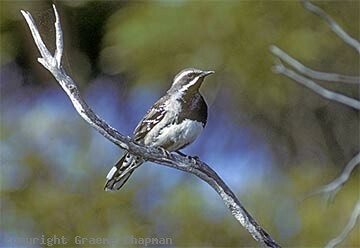 they not only occur inland but are found in mallee woodland near the sea, both on the south coast (such as at Eyre Bird Observatory) and on the west coast near Shark Bay. Like all quail-thrushes, they spend most of their time on the ground where they forage for both invertebrates and seed, but at daybreak, mainly in the breeding season, the males do sing from an elevated perch a few metres from the ground. In all but the driest desert regions, they appear to be permanent residents and live as pairs in territories. Rarely do you see more than one bird at a time in the bush unless you are lucky enough to chance upon a nest or an adult with fledglings. They are very shy birds so little is known about their life history. They are virtually impossible to follow and your only hope to observe them is to just sit quietly and watch. They never form flocks or associate with other birds. Recent research has suggested that the subspecies 'clarum' from inland Western Australia and northern parts of South Australia as far south as the Gawler Ranges is actually a different species, soon to be known as Copperback Quail-thrush. Pics #437206 and 208 of a male from Yardea show the characteristic chestnut scapulars of this form, but according to the Directory of Australian Birds, Yardea lies within a broad intermediate zone between the two "species", so I hesitate to label him as a Copperback Quail-thrush. See also under Copperback Quail-thrush. 437202 ... Chestnut Quail-thrush, adult male. 437203 ... 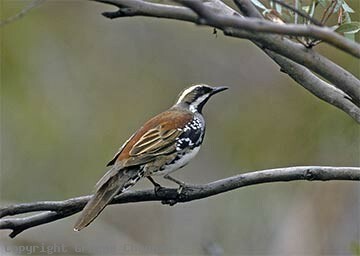 Sometimes called Chestnut-backed Quail-thrush. 437204 ... Chestnut Quail-thrush, male from near Eyre Bird Observatory, Western Australia. 437205 ... 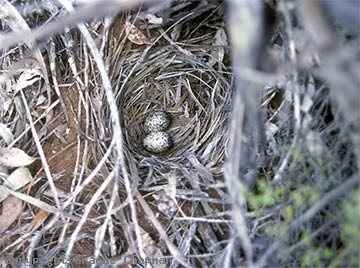 Chestnut Quail-thrush nest and eggs. Clutch size is almost always two.